"Behind all lore is truth. Find the jewel hidden within. Then all you wish to know will unfold." While writing this book, I thought, "Can I write about Sri Skanda and not about his older brother, Ganesha, the first son of Siva?" Of course, I can't. With that in mind, my thoughts flew backwards to my early days in the Orient. I remembered saying in jest and fun to a newly found Hindu friend who had a picture of Ganesha, "Who would worship an elephant?" And I merrily laughed in fun, though not in ridicule. A day later, while sitting in meditation, who appeared in my inner vision but an elephant with laughing eyes. I apologized and never made fun again. I have learned to love Sri Ganesha's form, but rarely in any statue have I seen it correctly carved, especially the face which, though full of mirth, is the epitome of wisdom itself. When I had learned to appreciate, understand and love Ganesha's elephant form, He gave to me a gift  to see Him as His True Self, as He is in His celestial abode. I awakened on the ceremonial day of His birthday. Ganesha stood there on my altar in all His splendor, in His princely celestial form. He looked very much like Skanda. I said, "You are so beautiful, as beautiful as my Skanda," and then I laughingly said, "Well, nearly as beautiful, not quite." He serenely smiled, and all day He remained in this glorious appearance. On the next day, He returned to His elephant form. In Jaffna in southern Ceylon is an ageless, ancient temple, carved in beautiful stone. Inside is one small shrine which I often visited before going to see Yogi Swamigal, a great saint who lived in Jaffna. When I would go to him, he would always say, "Have you been visiting the stone swamis again?" I would say, "Does it matter?" and he would chuckle, "No." At this particular time, I was having many troubles and felt I had reached the end of my rope. I wanted to go home, but was not given permission to return to the United States by the Masters. I walked up the three small stairs to the little shrine. It was very dark inside the inner sanctum, where a black carved stone statue of Ganesha in His elephant form was enshrined. I could not see the form in the darkness. With tears running down my cheeks, I heard myself call out, while standing in front of a Hindu shrine, "Jesus! Help me, Jesus! Please, Jesus! Help me!" I thought I saw a movement within the shrine, as if someone inside was waving a black cape. I peered inside intently. To my amazement, I saw the large stone ears of Ganesha waving back and forth. The stone statue had come alive. I was surprised, for I had called to Jesus, and both Jesus and Ganesha had heard my prayers. And as I stood there, I remembered the story of a saint who was asked by a woman to petition on her behalf to Mary. The saint then knelt before a shrine of Saint Francis and started to pray. The woman stopped her and said, "You are making a mistake. I asked you to pray on my behalf to Mary, not to Saint Francis." The saint answered, "All shrines are the same, for it is God who hears our pleas and answers them." I walked away from the temple feeling that the world was all right. And as I went out into the sunshine from the dark, cool temple, I felt as if all the heavens had opened and God was one and had heard me. I have pondered much on the true meaning of the form of Ganesha and have never found an answer that would clear my soul's yearning to know the truth behind His form. 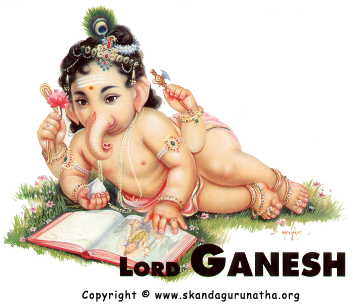 One day I went to my room and laid down and said, "Ganesha, could you explain what I would like to know?" I fell into a deep sleep. Suddenly I was awakened by Ganesha and I heard Him say, "Take a pen in hand and write." I did not move. He repeated, louder, "Take a pen and write." "To bring understanding to the illiterate of long ages ago, so long ago that the flood had not yet engulfed Lemuria, fables or tales were told to the race emerging from the darkness of an unenlightened mind. These stories had been handed down and have remained as symbols to be understood only by the few. "Just as Jesus spoke in parables only to those who were to understand, so in those long ages past, to bring intelligence to the race emerging from ignorance and to awaken some understanding in their brains, symbols were used to educate them and quicken their evolution. "This was in the age when the Gods walked the Earth and were the spokespersons for the illiterate and just-awakening souls. The initiated understood that the signs were used to stir the intellect of the unfolding race. These symbols have remained until this day, handed down from father to son, mother to daughter. Many still worship them, hardly understanding what they do. Yet when a heart is felt in a mantra or prayer, can a God resist love? "It matters not the legend, as you call it, or the beginnings, if the heart is open. Slowly, the understanding and higher consciousness will follow and be experienced within as the growth of the soul. For is that not what man's life on the physical plane is all about? "The growth is the moving upward from the lowest chakra to the highest chakra. Does it matter what My form is all about if the results ensue? The ignorant, the unlearned children, will not want change, but change will come in spite of that, for at the time of the end of every age or epoch, there is a cutting away of the old. Jesus said, `I am the true vine, and My Father is the husbandman. Every branch in me that beareth not fruit, he taketh away, and every branch that beareth fruit, he purgeth it, that it may bring forth more fruit.' (John 15:1-2). The branches that are not taking root in the Truth, that are dead, must be cut away to make room for the living. "You have known Me in My true form, as beautiful as My Brother Skanda, but do you love Me any less in a grotesque appearance as an elephant? Does My princely and Godly form, as you call it, give you any more wisdom, or does it just plant a seed of desire to understand what is behind the symbolism? "When I appear to you as Ganesha the Elephant, and you say you see beauty, joy and laughing eyes, is that not as beautiful as a princely form? I have nurtured the race from its inception long ages past and will continue to do so for the children of the planet Earth. Is that enough? Or do you need to know that I am Wisdom and that I bring it forth within all who worship and open up their beings to know the Truth? "All Hindu myth is symbolic, and behind each form is another story for those who seek. To know truth, one must step aside from the Earth and fathom deeply. These answers, when discovered, satisfy the soul. Others, steeped in fantasy and lore, will have no interest in these inner meanings. The outward appearance is enough for them. They wend their way from life to life, never digging deep into the mystery of the Self to find the diamond hidden there. To those of My children who have lived eternally in the Light, I am a Prince, I am Divinity, it is true. I took the elephant form to teach, awaken and stir the cells of the brain in those who dwelt upon this Earth so long ago, who were swallowed by the flooding waters and sank below. "Again, in another age, they took form to start the upward climb to knowledge, just emerging from the animal state, this everlasting wending upward from dust of earthly life. Could I, as a Son of God, have helped that race with words not understood, when all that they could comprehend was to strive and live from dawn to dusk? "The evolution of man has been slow but sure. Time is naught; it is a fragmentation of the mind." "The two forms I just revealed are both true. Both are real to those who know I am a princely form; to others, I am Ganesha the Elephant. I am the Intelligence, the Word of Truth, that starts the upward climb. As it has been said, "In the beginning was the Word," and the beginning was Intelligence. So My trunk forms the letter in Hindu scripture that represent Om, the word or sound of thought. In those days when giants roamed the Earth and the Sons of God came down to help the race of Mother Earth, I repeat, I trod the Earth. And as time ensued, to create an understanding of what I was teaching, a symbol for the newly evolving race was made. The simplicity of an elephant was one which could be understood  one who could overcome all obstacles. The overcoming of obstacles of the lower self was taught thus. "That I have shown you My True Self, does that make you wiser or your life less hard? Or does this answer the riddle that you have so long pondered upon when others would not listen as you tried to tell them of My True Form? "You have seen with your soul's eye the truth of My Being. The race of Earth still in ignorance dwells, hardly using one small portion of its God-given brain. It remains stagnant and ignorant, unable to understand Wisdom and Life, Truth and Light. We of the celestial realms plead that evil shall drop its dark veil that has kept man in ignorance of his own Self. For this, My Brother of many names � whom you address as Sri Skanda and others call Subramanyam, Murugan, and other such names until they realize that He is the Divine Essence of God � took form to break the darkness of evil. I have taken form to break the darkness of ignorance. "Thank you, children, for your interest in Truth. I will reward all those who will read this book and understand with their inner souls. Ganesha or Prince, all the same am I. What matters the outer form to the One on High?" "I, Sri Ganesha, First-born Son of Siva, have spoken." After Ganesha finished, I came out from my room deep in thought. "Is this true, all that Lord Ganesha has said?" My eyes were drawn to a bright yellow pamphlet in the bookcase. I took it out. It was called The Glory of Ganapati (another name for Ganesha), written by Sri Vasishtha Ganapati Muni. This book was new to me and I started to read it in amazement, because within this little booklet's pages was confirmation of all Sri Ganesha had said. The Hindu scriptures and the Bible were coming together in truth. It said, "Ganapati represents the Primordial Sound from which all worlds have taken birth. He is the Lord of the Spoken Word, the Master of Speech." The Lord of Speech represents the sound 'Omkar,' or `Om.' This was reminiscent of the first verse of John in the Bible, "In the beginning was the Word and the Word was with God and the Word was God." I turned another page, and Sri Muni said, "The Image may look monstrous, grotesque [the same word used by Ganesha] to the ordinary vision, but to those who can really see, the divine beauty and harmony of form will be unfolded." He called Him "Prince Elder, the first-born." In the Vedas, the Hindu scriptures, the Creator of Word is in charge of creation, because all manifests from sound. "Counted as first in the Galaxy of Gods, He occupies a unique place in the worship of the realm of yogic sadhana (spiritual effort). To rational minds, the half-animal and half-human form of the deity is the creation for a primitive age when man was first emerging from the subcontinent in an animal state. In this way, the Elephant was understood by those whose evolution was just beginning. To make the Godhead understandable at the time of Lemuria and before, they cast the idea, the power and the purpose of the Godhead into a figure or image. As Sri Aurobindo said, `The spirit in form, the soul in body.'" Sri Muni continues: "Therefore the Gods came down from the Supreme Ether, to take their part in the cosmic functions, and also to descend to Earth and be born in the heart of man so there would begin to grow a relationship and intimacy and finally an identity between God and Man." Thus, Sri Muni's book confirmed all that had come from the wisdom of the diamond within, as told to me by Sri Ganesha. The Bible also confirms this: "In those days there were giants in the Earth; and also after that, when the Sons of God came in unto the daughters of men." This was a sacrifice of the Celestials to help hasten the evolution of humankind. Christian doctrine says that the Lord, the Father, is in heaven and sends the Son of God to bear the cross and lead humanity. This truth also is sustained through the work of the Perfected Beings. These Masters are high above, watching closely the progress of the Earth, and they manifest or send down their emissaries to help at the hour of need. The Planetary Beings are watching over us, ready to come to our rescue if necessary. Therefore, many parts of the puzzle of life found in various scriptures have come together to make the picture more clear. O Son of Siva, shining like a resplendent sun, a Prince, please keep Thy word to us and dispel the veil of darkness from all who read this book and let them be triumphant in combat with their inner battles and be unvanquished and know their own True Self.